There are seemingly endless activities to do in the Everglades – much more than just a walk on the trails! The Everglades is a National Park filled with things for you to do. Whether you go alone, with a group, with a loved one, or with children, there’s activity to suit your needs and wants! As an airboat tour company, we highly recommend you experience an airboat tour through the waterways of the Everglades. You will see sights that you will never get to see any other way! Gliding through the water past plants and animals is a fun experience like no other! Once you’re done with an airboat tour, you may be looking for other activities to do during a trip to the Park. For this article, we wanted to share some activities offered in the Park that are definitely worth checking out! Biking – You can ride your bike in Shark Valley, Snake Bight Trail, and Long Pine Key Nature Trail. Bird Watching – There are many spots across the Park to watch birds, but be aware that during nesting seasons bird watching may be prohibited in certain areas of the Park. Boating – If you own or rent a boat, you can explore the Park on your own. There are also boat tours that leave from Flamingo and the Gulf Coast around the Park. 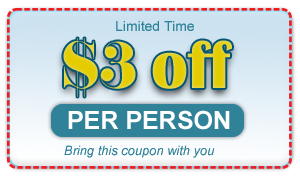 Camping – You can participate in front-country camping and backcountry camping in the Park. The Long Pine Key and Flamingo campgrounds have restrooms, grills, picnic tables, and sites for tents and trailers. Fishing – You can fish for salt and freshwater fish in the Park. However, you must follow the Park’s and state fishing regulations to avoid being ticketed. Geocaching – You can participate in a “treasure hunt” outdoors by finding hidden geocaches (containers) using GPS devices. Kayaking/Canoeing – You can explore the Everglades on your own through the waterways. The Wilderness Waterway is 99 miles, but there are many other shorter waterways to paddle. Slough-Slogging – Slough-Slogging is off-trail hiking where you can get closer to species in the Park. Tours/Programs – Led by guides or rangers, you can take guided tours to learn about the Park. These are just some of the activities for you to experience while visiting the Everglades! 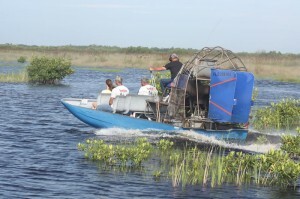 All these activities are fun, and we highly recommend them, but an airboat tour is hard to beat! An airboat ride is a once-in-a-lifetime experience. You’ll get to glide by so many different animals, birds, and plants. To book an airboat tour, call Captain Mitch’s Airboat Tours at 800-368-0065 or click our Private Everglades Airboat Tours page.